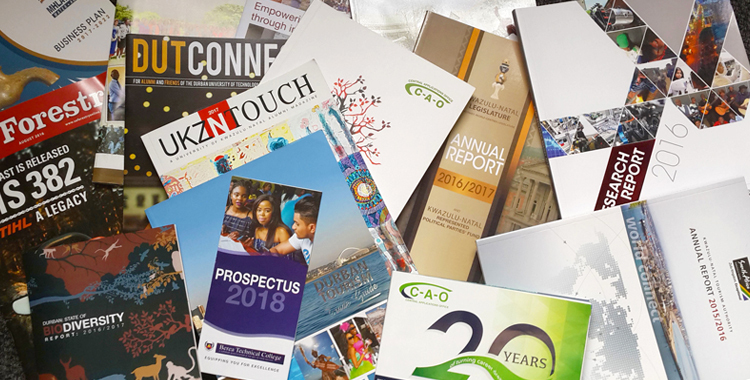 Do you need to produce a printed publication but don’t know the first thing about what kinds of paper are available, which binding will be suitable and what printing effects will make your cover pop? Here’s a guide that will help turn your publication trial into a triumph. If you have a big budget, we recommend using 148gsm Magno Matt or HiQ (you must varnish it) for the inside pages and 300gsm (or 700gsm if case bound) for the cover. If your budget needs to stretch further, we recommend using 148gsm HiQ – matt or gloss for the insides and 300gsm – matt or gloss for the cover. Although more expensive and temperamental, environmentally friendly papers are great for promoting a carbon-friendly, eco-conscious image. If your boss insists on using this option, we recommend using 140gsm Cyclus/150gsm Heaven 42/150gsm Reprint Matt (60% recycled)/150gsm Cocoon (100% recycled) for the insides and 300gsm paper, which is FSC approved, wood free, and uses solid bleach sulphate (no chlorine) for the cover. We recommend using 90-128gsm HiQ – matt or gloss – for the insides and 300gsm for the cover. Matt looks more corporate, and gloss is better for flyers and tourism brochures. We recommend using 80-128gsm coated HiQ or Superwove – matt/gloss for the insides and 300gsm for the cover (if it is not self-covered – meaning the grammage of the cover is the same as the inside pages). We recommend using 80-120gsm Cartridge – matt or gloss – for the inside pages and 250-300gsm Cartridge for the cover. We recommend using 200gsm HiQ for a wall hanging calendar (128gsm if it is rimmed and has multiple pages). Use wiro binding with an eylet on the top in the middle (if it is a single page). For a desktop calendar, we recommend using 200gsm HiQ, having it wirobound, and providing a sturdy board to keep it upright (anything over 300gsm, otherwise it will collapse). We recommend using 250gsm Curious Metallic if you have a big budget and 250gsm HiQ board if you need to stretch your budget. Use 250gsm Cocoon, Cyclus, Heaven 42 or Reprint Matt if you need to use an environmentally friendly option. For big budget runs, we recommend using 300gsm Opal, Curious, Lux board, Enigma (business cards), and 80gsm bond for letterheads and comp slips if you have a small budget. Signage is normally produced in vinyl unless it is attached to Chromodeck – a steel plate. Billboards are normally produced on vinyl (self-adhesive). Outdoor banners must be printed on material: Tear drop banners and wall banners are printed on Polytwirl material. Pull-up, hanging and street pole banners are printed on PVC. Invites should be printed on 300gsm Curios and Opal if you have a big budget and 300gsm HiQ if you have a smaller budget. Folders can be printed on 280-300gsm Invercoat if you have some decent money to spend. They should be die-cut to accommodate a pocket and laminated. If you need something more economical, print them on 300gsm HiQ and laminate them. Binders have four or two rings, and are printed in spot colour on Pliplax (perspex material) or on 135gsm paper and laminated to board. This is the method used to hold the publication together. If your publication needs to look corporate, sophisticated or high-end, you will need to spend some extra money on effects on your cover and/or selected pages. Knowing this handy information will go a long way in ensuring that you not only sound knowledgeable but also feel empowered to order the design and print of your next publication. Go ahead, impress your graphic design studio with your ordering skills!